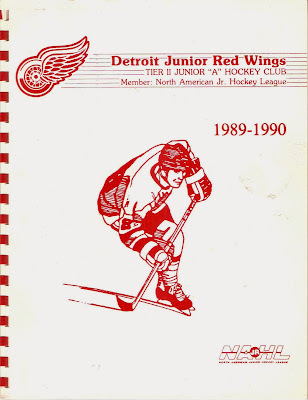 A few posts back I had a program from the OHL's Detroit Junior Red Wings. There were actually a few teams that went by that nickname, going as far back as the 1970s. I have programs from two of those teams. This version of the Junior Wings was a member of the Great Lakes Junior Hockey League, a precursor to the North American Hockey League. There were five clubs in the GLJHL at the time, and all but one in the Detroit area (the other being in Port Huron). Skeets Harrison was the Head Coach while Tom Wilson was General Manager. The Executive Committee behind the Jr. Wings included Hall of Famers Alex Delvecchio and Budd Lynch, as well as former NHLers Billy Dea and Denis DeJordy. The Wings played their home games at both Lakeland Arena and Olympia Stadium. 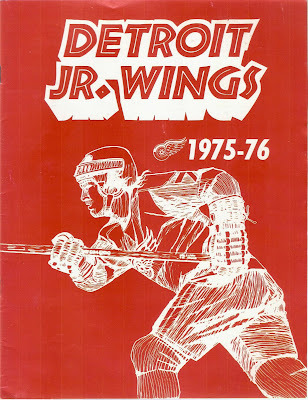 The Junior Wings were coming off a National Junior A Championship in 1974-75, so expectations were high. In 1975-76, the Wings followed that success up with an excellent 34-11-3 record. Their 71 points were just one point shy of Detroit Little Caesar's in the league standings. Darryl DiPace led the Wings in scoring that season, with 37 goals and 89 points. Six other players on the roster had at least twenty goals on the year, an impressive stat for a 48-game season. As a group, the Wings scored 234 goals, second best in the league. On defense, the team allowed only 152, alternating between four different goaltenders. The Junior Wings had several notable alumni during it's run. Two members of the 1980 Team USA "Miracle on Ice" squad, Ken Morrow and Mark Wells, played for the Wings. Hall of Fame defenseman Mark Howe and his brother Marty played earlier for the team before jumping to the OHL. The Junior Red Wings continued on for several more years until suspending operations in 1983. For a mid-level junior hockey club, this isn't too bad of a program. It's twenty pages, full of game pictures and advertisements, as well as a schedule. When I bought this, the seller claimed this program was found in Olympia just days before they tore the building down in 1986. Not sure if that's true or not, but it's pretty cool if it is. 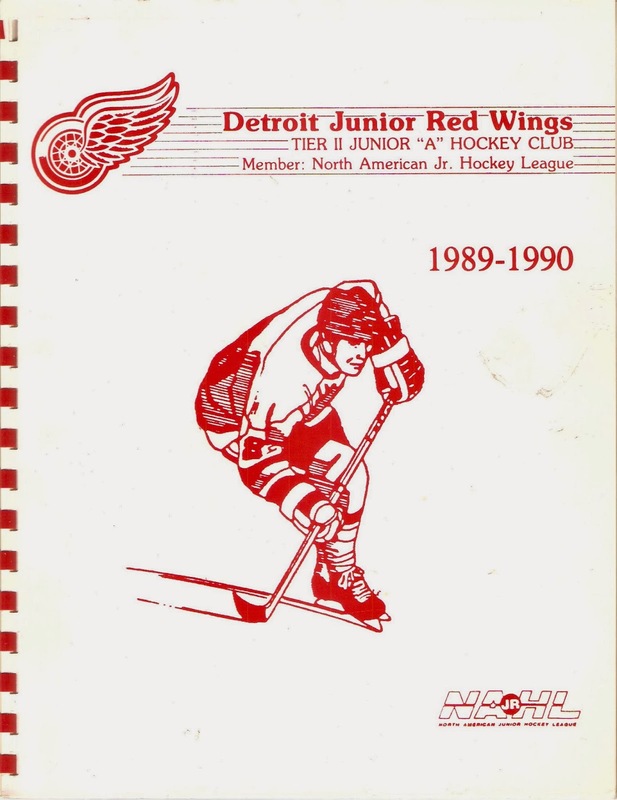 The 1989-90 edition of the Junior Red Wings were part of the North American Hockey League. This version played their home games at Fraser Ice Arenas and had Lyle Miller as President. Dan Walsh was Head Coach, while Doug Sloan was Vice President/General Manager. The Wings finished in second place in the NAHL's Eastern Division, going 24-18-2. The 50 points the team piled up were nowhere near enough to catch Compuware, who went an incredible 42-0-2 on the year! I couldn't find any statistics on the Junior Red Wings, but there were some familiar names on the roster. Rob Valicevic went on to play in the NHL for parts of six years. Jeff Blum played in the UHL for several seasons as well. Don't really know what happened to this version of the Junior Wings. I remember a NAHL team called the Detroit Freeze that played in Fraser when the Detroit Falcons were in town. Perhaps they switched names? This is an unusual program in my collection. Take a look at the spiral binder for a spine! Mostly all of the programs are simply folded and stapled together. Plenty of pictures and advertisements for a NAHL team, pretty impressive.